Scientists in the U.S. have cured colour-blindness in monkeys, with an eye to one day doing the same for people. The researchers at the University of Washington and the University of Florida used gene therapy to restore the colour sensitivity of two squirrel monkeys, and say the technique could one day treat other vision disorders involving the eye's cone cells. "We've added red sensitivity to cone cells in animals that are born with a condition that is exactly like human colour-blindness," William W. Hauswirth, a professor of ophthalmic molecular genetics at the UF College of Medicine, said in a statement. But even if you can cure monkeys of colour-blindness, how would you know? 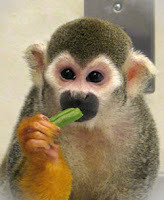 The answer begins 10 years ago when Jay and Maureen Neitz — both ophthalmology professors at the University of Washington, and authors on the study — began training two squirrel monkeys named Dalton and Sam. Hauswirth and colleagues at the University of Florida developed the gene therapy technique used in the experiment. The scientists wanted to produce a protein involved in red-green light sensitivity, called long-wavelength opsin, in the monkeys. The genes that code for opsin were introduced into the monkeys using a harmless virus that incorporates its DNA into the host cell. "We used human DNA, so we won't have to switch to human genes as we move toward clinical treatments," said Hauswirth. In the study, published this week in the journal Nature, the squirrel monkeys began to show signs of colour vision about five weeks after the gene treatment. CBC Radio's Quirks and Quarks will have an interview with Jay Neitz, Sat., Sept. 19. "It was if they woke up and saw these new colours. The treated animals unquestionably responded to colours that had been invisible to them," said Jay Neitz. It took more than a year and a half for the researchers to test the monkeys' ability to see 16 different hues. be useful in correcting lots of different vision disorders," Neitz said. Genetic disorders of the cone cells in the eyes include achromatopsia, which causes poor central vision, as well as complete colour-blindness. The researchers said the same treatment could potentially cure this disease, as well as vision problems associated with aging and diabetes.